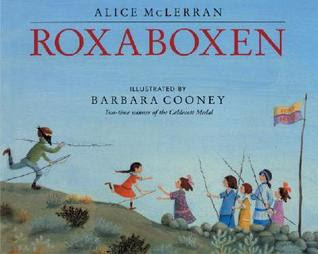 For Aaron's very last preschool class of the year, we had it at our house and used the book Roxaboxen by Alice McLearran as the basis for all our learning. I don't think there is a more perfect picture book for summer than Roxaboxen. It was based on the real summertime fun of real children in Yuma, Arizona many, many years ago (Alice McLearran's mother was one of those children). Roxaboxen was the creation of their combined imaginations. They constructed it on a rocky hill. They used "round black pebbles" for money and made houses from big stones, old wooden boxes, and broken bits of pottery and glass. They had a bakery and two ice cream parlors, as well as a mayor and policeman and a jail (for those who were caught speeding). The years went by, but Roxaboxen remained, always there, waiting for imagination to visit it again. I needn't have worried about the children liking it. The name alone, Roxaboxen, was so much fun for them to say and sounded like a place they would want to go to. Now I have to start with a little disclaimer: This lesson turned out far less magical than I was hoping for. I was really wanting to recreate some of those adventures that were so well-expressed in the book. We tried, but I have to say that three things hindered the reality I wanted: First, two hours was just not enough time. The children took much longer than I was expecting on the two projects we did. I was so happy that they were creating and enjoying themselves, and I probably should have just let some of the other things slide, but I knew they would enjoy everything, so I tried to pack it all in. Second, I waited too long to give them a snack (which I will explain more about below). Third, Maxwell had perhaps the biggest meltdown of his entire life. Luckily, children are usually able to overlook such disasters, so I think (I hope) it was mainly me that felt flustered and frazzled. For our first activity, the children decorated steering wheels. Yes, steering wheels. In the book, it says: "Everybody had a car. All you needed was something round for a steering wheel. Of course, if you broke the speed limit you had to go to jail." Don't you just love the soft, warm colors Barbara Cooney uses for the desert? I didn't think a walk around the neighborhood would produce too many round, steering-wheel-like contraptions. So I had Mike use the laser at school to cut out a simple steering wheel shape from cardboard. I gave each of the children a cardboard steering wheel and let them paint and decorate to their heart's content. This was probably the most successful activity of the morning. At this point, we still had all the time in the world, and all of the kids were totally engaged and happy. Each steering wheel turned out so different and unique! It's so fun to see how the children's personalities come out in their art. We left the steering wheels on the counter to dry and turned our attention to the desert. I helped the children make their own desert scenes. First they glued down some sandpaper (for authentic texture, haha) and drew a sky. I wanted them to have some cutting practice, so I drew a cactus shape onto some green craft foam and let them cut out the cacti themselves. I knew we wouldn't have enough time for them to cut out everything for their pictures, so the night before, I cut out a bunch of desert animals for them to color and glue onto their papers. We included a kangaroo rat, roadrunner, scorpion, jackrabbit, rattlesnake, coyote, and a gila monster. It was at this point that things started to fall apart. We had already been going for over an hour, and the kids were ready for a snack. As I was planning this lesson, I had the "genius" (sarcasm intended) idea to have them help me make homemade ice cream. In the book, it says that Roxaboxen boasted, not one but, two ice cream parlors. And all the children always had plenty of money (round black stones) to spend on plenty of ice cream. What could be more fun, yummy, and satisfying than making our own ice cream? Because of the lengthy interest in the art projects, I couldn't get the kitchen cleaned up enough to start making the ice cream until we had about 40 minutes left. As it happened, a couple of the boys had finished their desert landscapes and run off to play, and the others were still hard at work on theirs. So I just started making the ice cream on my own while hurrying around the table and letting the remaining kids dump in the ingredients. We just have one of those ice cream makers with the frozen bowl and the turning handle. Of course it took me probably ten minutes to get the seal around the bowl and lid snapped on, and then I cranked the handle like crazy, hoping that it would miraculously turn into smooth and creamy ice cream in five seconds. It didn't. Meanwhile, the kids were getting restless, so we left the ice cream and moved outside for a speed limit game. By this time, their steering wheels were dry, so they each took their own and lined up on the driveway. I had made several speed limit signs, which one person held at the end of the driveway while the other children raced toward him/her. The idea of the game was that if he held up a higher number (20 instead of 15), they could go faster. But if he held up a lower number (10 instead of 20), they had to slow down. If they didn't slow down, the one holding the signs could send them to jail (similar to the book). My hope with the game was that the children would learn to recognize higher and lower numbers in relation to each other. I figured out early in the game that it was really only possible for them to manage two signs at a time, so we just set the other ones aside and switched them out when it was another person's turn to be the speed limit police. They actually really enjoyed this game, but it got a little out of hand when one of the little boys took off around the corner and up the street. We had to take a little break after that. Every couple of minutes I went inside to give the ice cream another few turns and to note how un-quickly it was freezing. Finally, we moved onto the last activity, which I was actually hoping to be able to give the most time to but which ended up getting the least: letting the children create their own Roxaboxen. I got out the sidewalk chalk and matchbox cars and gave each child a bag of clear stones (like the kind that you would put in a vase). I showed them how they could draw roads or houses with the chalk, and then I left them to use their own imaginations. You can see how this activity, under different circumstances, could have lasted for hours. I will say that they did enjoy it, but their play was interrupted with cries of "I'm hungry!" and "I'm hot!" so it definitely wasn't ideal. While they played, I rushed back inside, saw that we had ten minutes left before parents would arrive and decided that the soupy ice cream was thick enough to be called a shake. I dished it up, took it outside to the starving children, and thought that we had made it. And of course, it was just at that moment that one of the moms came to pick up the kids. It was a good thing this was the last class of the school year, or I might have been permanently kicked out of the co-op. I shared this post at Raising Memories. I love how you don't make it seem perfect. I will be trying some of these activities with my preschool class this coming week. Thanks!